John William "Johnny" Carson (October 23, 1925 – January 23, 2005) was an American television host and comedian, known for thirty years as host of The Tonight Show Starring Johnny Carson (1962–1992). Carson was born in Corning, Iowa, in 1925, to Homer Lloyd "Kit" Carson, a power company manager, and Ruth (Hook) Carson, who was of Irish ancestry. He grew up in the nearby towns of Avoca, Clarinda, and Red Oak in southwest Iowa before moving to Norfolk, Nebraska, at the age of eight. At the age of twelve, Carson found a book on magic at a friend's house and immediately purchased a mail-order magician's kit. He debuted as "The Great Carsoni" at age 14 and he was paid US$3; many other performances at local picnics and country fairs followed. 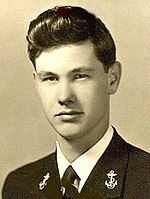 Carson joined the U.S. Navy on June 8, 1943, received V-12 officer training at Columbia University and Millsaps College, and continued to perform magic. Carson died in West Hollywood, California from respiratory failure caused by emphysema, aged 79. ↑ "Careers Johnny Carson". Military.com. Retrieved 2011-04-26. ↑ "Timeline". Millsaps College. Retrieved January 12, 2014. Watch on line either clips from or entire program Johnny Carson King of Late Night - Watch The Full Documentary pbs.org Includes a page on the making of the documentary. Follow Johnny Carson on Twitter at https://twitter.com/JohnnyCarson and Facebook at http://facebook.com/JohnnyCarson. Severo, Richard; Carter, Bill (January 24, 2005). "Johnny Carson, Low-Key King of Late-Night TV, Dies at 79". The New York Times. Retrieved January 12, 2014. This page was last changed on 22 November 2018, at 08:58.